The band's "Love Yourself: Tear" ranked No. 1 on the Billboard main albums chart on Sunday (US time). On the Billboard Hot 100 main singles chart, rapper Psy is the highest-charted K-pop singer as he stayed on the chart for two consecutive weeks for "Gangnam Style" in 2012. 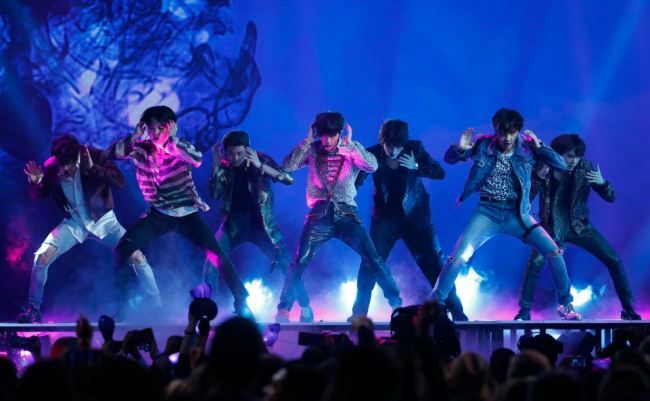 The BTS album, released May 18, launched with 135,000 equivalent album units earned in the United States in the week ending May 24, the online edition of the U.S. Billboard magazine said, citing tallies from Nielsen Music. Of that sum, 100,000 were in traditional album sales, it added. The chart ranks the most popular albums of the week in America based on multi-metric consumption, which includes traditional album sales, track equivalent albums and streaming equivalent albums. The album, released May 18, launched with 135,000 equivalent album units earned in the United States in the week ending May 24, the online edition of the U.S. Billboard magazine said, citing tallies from Nielsen Music. Of that sum, 100,000 were in traditional album sales, it added.